"Becoming the handcycle world speed record holder has been the greatest sporting challenge of my life." The Guinness Book of Records has inspired countless people to strive for some of the most iconic – and outlandish – feats of achievement and endurance. Now, to that exalted roll call of record breakers, a team of academics and students from the University can add their names. Led by Adam Kyte, in the School of Marine Science and Engineering, and spearheaded – almost literally – by former London Marathon winner Sarah Piercy, the team overcame near Hollywood biopic levels of disappointment to set a new speed record for women’s handcycling. On the long, straight roads of Nevada, USA, in a machine designed in the workshops of Plymouth, the existing record was beaten by 0.1mph, and a certain amount of cosmic karma was restored. The University’s association with handcycling started just before it shot to popularity at the London Paralympics, following an approach by Alan Grace, former chairman of the Handcycling Association of the UK. On the back of that, work started in earnest with a view to taking a University team to the 2015 World Human Powered Speed Challenge. 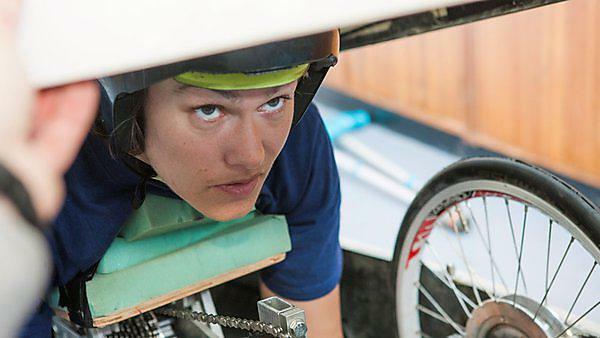 Gaining support from local, national and international businesses, the team designed and built an eye-catching bike, and teamed up with Liz McTernan, ranked in the world’s top eight in her sport, to try and beat the then women’s benchmark of 21.39mph. With that in the back of their minds, the team decided to try again in 2016, teaming up with Sarah – who won the women’s wheelchair race in London in 2000 – and Help for Heroes ambassador Chris Jones. They improved the bike, and began a programme of testing to ensure both athletes were happy with it. In July, however, there was another setback when Chris had to withdraw from the project for family reasons. Undeterred, the team put their full support behind Sarah and to ensure she was in the best possible shape for the record attempt, she worked closely with physiotherapists, nutritionists and sports psychologists from the Faculty of Health and Human Sciences. In testing at RAF St Mawgan, in Cornwall, she was close to world record pace, and so heading out to the United States, the team were in a positive mood. More than a day of travelling did little to deter their spirits with the team (who consisted of students Matthew Sharman, Matthew Pearson, Louise Kiero-Watson, James Haslam, Daniel Bristow, William Kemp, Oscar Whitmarsh, and Bradley Smith, and technicians Julian Seipp, Richard Cullen, Rick Preston and Neil Fewings) arriving in the remote community of Battle Mountain to join the rest of the competitors who were competing for leg-powered (rather than armpowered) records. They included Canadian Todd Reichert, who would go on to set a new overall recumbent speed record of 89.59mph and 17-year-old Florian Kowalik, from the US, who powered his way to 65.93mph. In her first run of the week Sarah reached more than 23mph, but then a succession of technical difficulties – coupled with inclement weather – limited the number of runs they could do. Over the next few days, she continued to push herself and the bike to the maximum, but when the times came through they were consistently below 23mph. Going into the final day, it was a real case of ‘now or never’ but all the hard work and very little sleep was rewarded when Sarah crossed the finish line with a maximum speed that looked to be just over world record pace. But there was still an agonising wait for it to be confirmed. Surrounded by her team, and fellow competitors, the tension was palpable. But when the organisers read out the mark of 24.85mph, and confirmed the wind speed was also legal, the project’s ultimate dream of setting a new world record was realised, drawing a standing ovation from everyone else in the room. Learn more about Project Nevada. A big thank you to James Haslam, Mechanical Engineering student with the University of Plymouth for compiling this amazing film which captures this exciting project.